The upshot was that other amplifiers suddenly seemed stripped of emotion and dry – including my own Luxman M-800A. A happy medium is yet to be found. Until someone does and if you’re looking for the most emotionally compelling musical experience, the Leben is one surprise answer. I reckon that most McIntosh Mc275 owners pursue a similar path. While the Leben has more resolution and color intensity than the American, the general sonic signature is quite similar. Another rationale for Hyodo-San’s voicing is his CS-28RX preamp. Having lived with and appreciated it for so long, I’d describe it as more analytical than valve flavored. In hindsight, I now understand that it was intended to complement the stable-mate amp (and others amps like the McIntosh or those by Pass). Another reason could be the ideal speaker it’s really meant for. It surely is no coincidence that Jeff Day ended up with the Harbeth M40.1 for one of his systems. Although quite large, those are monitors which benefit nicely from a more powerful bass injection. Ditto widebanders. I bet that the Leben would be the missing link or puzzle piece for such speakers. Once you audition the CS-660P, you’ll understand why I went on about its bass balance. You’ll also appreciate that this range doesn’t really stand out but is rather coherently integrated. I never thought of the sound as slow. I only had one prior similar experience during my review of the Hansen Audio Prince v2 speaker. First impressions suggested a somewhat dark warm sound at least relative to competitors. But the more I listened, the more I understood that it was actually closer to the live experience. When The Montgomery Brothers segued into a solo on Groove Yard, there were seriously potent dynamics which even my transistor Luxman didn’t track with this level of enthusiasm. The treble felt perfectly matched to the mid band such that I shouldn’t even talk of two discrete ranges. Analyzing them as such regardless, I knew that the treble was a bit warmed up and rounded over to not win on top resolution. Cymbals were vibrant and natural but their highest harmonics slightly laid back. Again I thought it a deliberate choice to prevent competition with the lower bands. It didn't matter whether it was Nice’N’Easy from Frank Sinatra’s Columbia vinyl The Voice or Queen's A Night At The Opera reissue - this element of the sound was consistenly made ‘more civilized’. It was of course a slight deviation from neutrality but in my opinion Leben’s master mind considered it very thoroughly. No matter which recordings I listen to, they all sounded great. Top-level valve amps like the Reimyo PAT-777 and Ancient Audio Silver Grand Mono 300B SETs achieve the same level of performance but not by playing with timbre and attack. Rather, they achieve it with almost perfect resolution and linearity. But they do occupy a rather steeper price level. To offer a similar emotional experience at a much lower price, one must use a few tricks. And the Leben does. My magazine is called High Fidelity. Should I only recommend devices with the most neutral performance? To me high fidelity applies not only to the sounds themselves but also to a certain intellectual and emotional content that’s embedded in the music. This definition the Leben fulfills better than perfectly because it adds something back that’s not really on the recording but nets a fabulous end result. The CS-600P is not the most linear power amplifier with the highest resolution. Yet like other hi-end and top hi-end machines, it fulfills their basic mission. Without losing sight of the theoretical absolute sound, they all must try to also fulfill the other requirements which are expected from them. They must go beyond raw sounds and step toward the emotional charge which live music with real instruments delivers. Description: The CS-660P is a stereo power amplifier offering 2 x 40 watts or twice that as a monaural amp. First stage amplification is based on two 6CS7 NOS General Electric double triodes per channel. Output is classic ultra-linear similar to Quad's II and likewise based on KT66 beam tetrodes which work in push-pull biased in class AB. One last tube on deck is a so-called dumper tube that delays the high-voltage B+ supply to protect the output tubes from damage and increase their life expectancy. But that’s not its only task and could be handled by transistors. It also influences the sound as another valve in the signal path. The rationale must have been a combination of solid-state rectifier strengths (speed and linearity) with those of rectifiers tubes (lower noise, a soft reaction to sudden voltage spikes). I can't tell exactly how this tube influences the sound but I'm sure it does. Each output tube is accompanied by a green LED for proper operational status verification including auto bias. Behind the power valves sit the output transformers made in house. Behind the dumper tube is the power transformer. Mine was a bit noisy but this will depend on the power grid. My noise changed depending on time of day. A mechanical power mains switch on the front panel is accompanied by a green LED and a volume knob. Around back we find a pair of high-quality Canary RCA posts (interestingly mounted in recessed XLR fashion) and two pairs of gold-plated speaker posts. A switch between the posts alters output impedance from 4 to 6, 8 and 16Ω. Another switch selects stereo or mono operation, two more chose proper bias/heater setting for your output tubes of choice. Finally there’s the ubiquitous IEC power inlet. 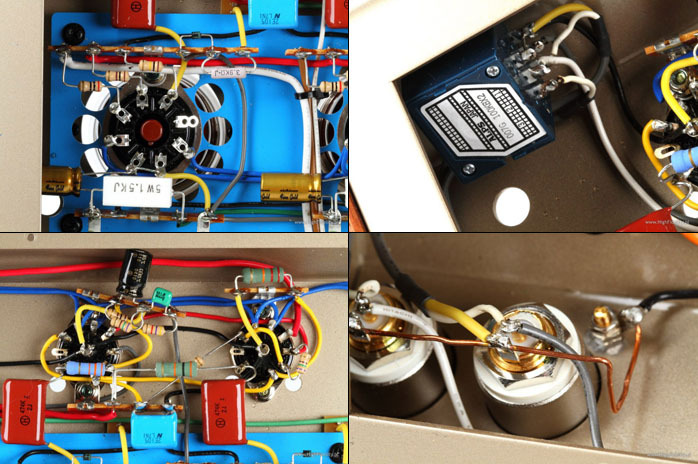 The insides are quite simple as is characteristic for most high-end tube amps. Via shielded flying leads, the signal proceeds from the remarkable Canare RCAs on the back to the big Alps Blue Velvet pot on the front, then to the input triodes. All low-signal wires are from Hitachi. Assembly is mostly point-to-point assisted by a few tiny PCBs with soldering posts. Japanese polypropylene capacitors couple the input to the output tubes. Most resistors are Japanese issue and there are excellent Nichicon Fine Gold caps on the power cathodes. The power supply runs a huge transformer with multiple secondaries. Two center-tapped solid-state diodes cover full-wave bridge-rectified anode voltages for all valves as delayed by the dumper tube. 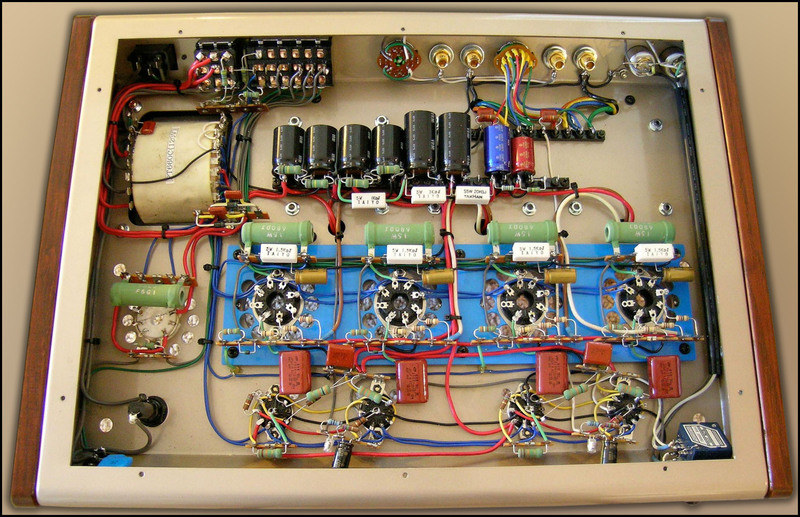 There are six large capacitors for the power tubes and two more for the input triodes to absorb supply ripple. The small-signal triodes are served by excellent Elna caps including Red Cerafine. It looks like filament current is DC. The whole design is very orderly, neat and simple.